Family Entertainment - Fireworks & Laser Light Displays when the sun goes down. Entertainment on and off stage - Bruce & Bruce Children's Entertainer, Tim Armstrong Band, Sonder, Flames of Plenty Fire Dancers, Stilt Walkers, Smile Amusements. Massive Bonfire. Colouring in Competition (Entry forms from The Warehouse Morrinsville); Lolly Scramble. Bring a picnic or purchase something from the variety of food stalls available. Please note - no personal fireworks and no alcohol. 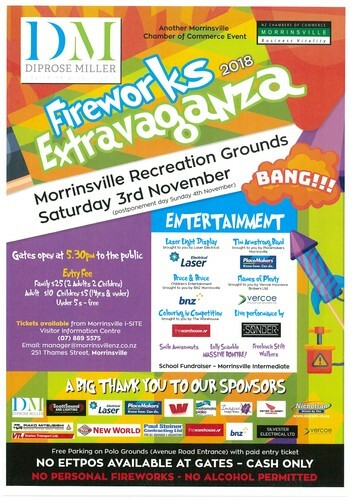 Tickets can be purchased at the gate on the night or through Morrinsville i-SITE Visitor Information Centre from the 23rd October.